As you may know, Redtail was founded by two wealthy chaps from London, on the heels of the stunning flip of a company that they bought and sold quite quickly, nearly thirty years ago, to great profit. I have to be very careful with my words here, as I’ve met the two central characters, and I’m a friend of many of their members. I don’t want to get sued for libel, or lose friendships. I will state that I was never invited to join the club, but I wouldn’t have anyway. I couldn’t afford it, I hate the drive down the 401, I had other issues with it, and above all, I just didn’t like the golf course, which I played three or four times many years ago. That said, there certainly was an intoxicating appeal to playing lush, manicured fairways on a sun-kissed Ontario afternoon, and seeing no one else but your playing partners on the course, in the clubhouse, or in the parking lot. The possibility of bumping into Sean Connery or Nick Price — or the Queen – was also kinda fun, too. On paper, the Redtail story – and that of other, similar “individually-owned” courses in other locations around the world – is an enviable one. Wouldn’t every serious golfer dream of having a huge wad of dough, enough to take a few million out and buy a couple hundred acres, then hire a team of people who know what they’re doing, and build a fine golf course for the use of yourself and a few of your buds? Many years ago, I worked in the summers for a gentleman who did just that in the 1950s. His name was Nelson Davis, and at the time, he was one of Canada’s wealthiest businessmen… having taken over his wife’s family business and built a hugely successful conglomerate out of it. Nelson also absolutely loved golf, and was pals with some of its biggest stars of the era, most notably Gardner Dickinson. One Sunday afternoon, Mr. Davis was standing on the third fairway of the club of which he was a member, in Toronto. The third hole there is a mild dogleg. As he waited for the green ahead to clear, a ball from the tee behind came screaming around the bend, took one bounce and hit him square in the back, knocking him down. The result was called Box Grove Golf Club, and it was built on the banks of the Rouge River northeast of Markham, in what was, in 1950, lovely rolling countryside. Nelson was the only member, I believe, but he certainly allowed friends and acquaintances to play. Many days there would be no one. Box Grove was a tough golf course. I played it once, when I was a decent player, and don’t believe I broke 90. It was said that the course record of one under par was held by Doug Sanders, who once lost the British Open to Jack Nicklaus, by missing a two-foot putt. Nelson Davis died a few years later. 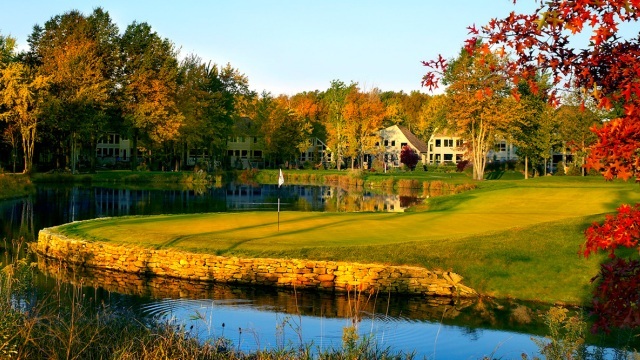 IBM Canada eventually sold its ownership of Box Grove, finding it hard to justify an exclusive golf retreat for its executives. The course was taken over by developers, and partially exists as a 9-hole facility today, called Markham Green, and surrounded by houses, no surprise. Several years later, no too far away from Box Grove, my old friend Gordon Stollery built his own private course. It’s called Goodwood, and I think it’s probably the finest golf course in Canada. Gordon died tragically a few years ago, and his family is maintaining the course with the help of some wealthy members. If you ever get a chance to play it, do. As for Redtail, I’m hopeful that the partners will resolve their differences, either amicably or legally. With some degree of familiarity, I can’t say I’m confident about that outcome, but what do I know? I just hope their differences will not affect the membership or the future of the club and the course itself. Private, public, or individually-owned, the loss of any golf course is an unhappy development, in my view. Jim Deeks is a semi-retired, Toronto-based communications consultant and television producer. A former Executive Director of the Canadian Open and Canadian Skins Game, he’s been writing personal columns and travel articles for Fairways for nearly a decade.